A refrigerator inside your laptop? 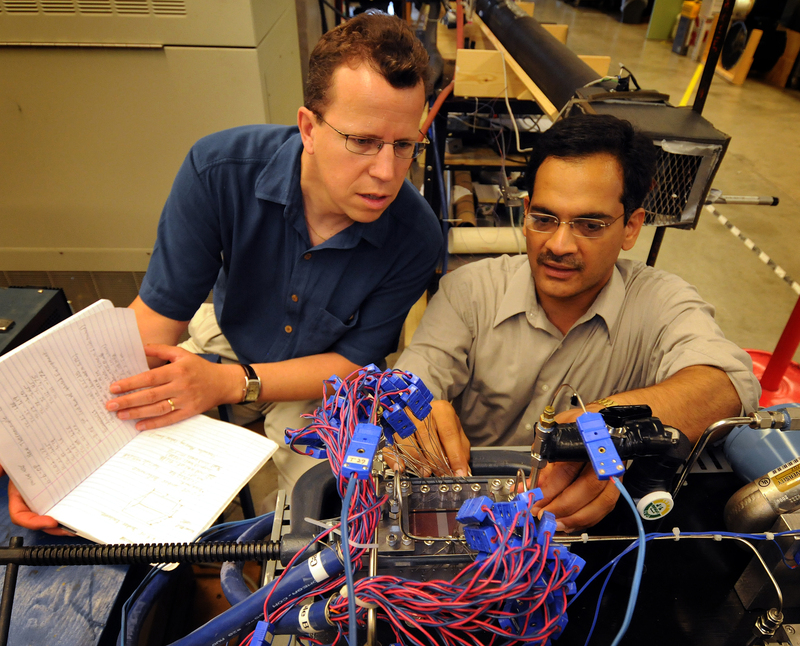 You can see above the two lead researchers, Eckhard Groll, at left, a professor of mechanical engineering, and Suresh Garimella, the R. Eugene and Susie E. Goodson Professor of Mechanical Engineering, collecting data "using a myriad of sensors to precisely measure how a refrigerant boils and vaporizes inside tiny 'microchannels' in a part of the refrigeration system called an evaporator." (Credit: Purdue News Service photo/David Umberger) Here is a link to a much larger version. For more information about Garimella's research projects, you can visit his personal website or check one of the labs he manages,the Cooling Technologies Research Center (CTRC). But why miniature refrigeration is better than other cooling technologies? Here are some Groll comments. "'The best that all other cooling methods can achieve is to cool the chip down to ambient temperature, whereas refrigeration allows you to cool below surrounding temperatures,' he said. The ability to cool below ambient temperature could result in smaller, more powerful computers and also could improve reliability by reducing long-term damage to chips caused by heating. One complication is that the technology would require many diaphragms operating in parallel to pump a large enough volume of refrigerant for the cooling system. 'So you have an array of 50 or 100 tiny diaphragm compressors, and you can stack them,' Groll said." This research work will be presented during several sessions of the 12th International Refrigeration and Air Conditioning Conference and the 19th International Compressor Engineering Conference on July 14-17 at Purdue (Link to the 2008 Herrick Conferences). However, the researchers have already published their results elsewhere. For example, the Journal of Micromechanics and Microengineering published an article named "Analytical model for an electrostatically actuated miniature diaphragm compressor" (Volume 18, Number 3, March 2008, Article 035010). Here is a link to the abstract. You also can read the full paper if you wish (PDF format, 12 pages, 998 KB). Another paper about this project was published by the International Journal of Heat and Mass Transfer under the name "Refrigerant flow boiling heat transfer in parallel microchannels as a function of local vapor quality" (available online April 11, 2008). Here is a link to the abstract. This research work could lead to interesting developments -- if it was cost-effective. Here is the view from the researchers. "Learning how to manufacture the devices at low cost is another major challenge, with industry requiring a cost of about $30 each. 'We can't currently produce them at this price, but maybe in the future,' Groll said."